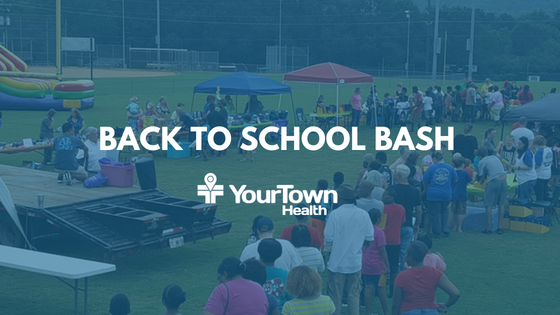 YourTown Health is proud to offer free health screenings for Meriwether County students Saturday, August 4th to help kids get ready to go back to school. The community is invited to attend the Champions of Children Back-to-School Bash from 10 am to 1 pm at the Manchester-Meriwether County Recreation Department, 124 Perry Street in Manchester. Dr. William Cunningham and Virginia Hudson, FNP-BC, from YourTown Health’s Warm Springs office will provide free health screenings for children. Dr. Brandi Maze, a dental hygienist from the YTH Greenville office, will also be there to provide free dental screenings. Adult health screenings will also be available on site, as well as free kids’ haircuts and quick braids, school supply giveaways, food, games, fun activities, door prizes and more – everything families need to prepare for the school year. “We want to help families start the year off right. Healthy kids do better in school and we want them all to thrive!” said Jon Wollenzien, YTH CEO. “We also want to make it as easy as possible to get great health care. That’s why we partnered to participate and sponsor this Saturday event that offers almost everything you’ll need to get ready,” he added. “Health problems can make the school year harder. Vision and hearing problems, tooth pain, asthma, stress… these conditions can really affect a child’s ability to concentrate and learn. That’s why we do these exams to prevent and catch problems early,” Wollenzien noted. Families who can’t make the bash are invited to call our Warm Springs office at 706-655-4088 or our Greenville dental clinic at 706-672-0819 to schedule a school year check-up. YourTown Health is a non-profit network of six community health centers serving the communities of Meriwether, Pike, Lamar, Carroll, Coweta and South Fulton counties for over 35 years. The centers provide access to quality primary care, pediatric care, women’s care, dental care and more, regardless of a patient’s ability to pay. The Palmetto location features dentistry, a pharmacy, plus obstetrics and gynecology services, as well as a fully bilingual medical staff. YourTown Health – Your Family. Your Health. YourTown. For more information, please visit www.yourtownhealth.com.